I have always been fascinated by how people’s actions impact each other. Nothing happens in a vacuum. One person’s choice can set off a domino effect across others’ lives. When you trace a consequence back through the actions that led to it, there are always a few places where a few people could have made a different choice and it would have completely altered the outcome. I wanted to play with the idea that one generation can make a choice that has unforeseen and devastating consequences on another. Time travel was essential to showcase this dynamic in action and have a rich sense of family going back centuries. I think it gave the story a bit of a saga feeling. By having my characters travel 129 years into the past, I could show how the past reached into the present and messed everything up. What I find fascinating is that even the most researched and thought-out decisions can have a weakness: bad information. There is only so much information available when a decision is being made. Sometimes, what you think is trusted information is actually incorrect, and it brings so many consequences along with it. We make choices every day. No matter how well thought out they are, the best intentions can lead to the worst outcomes. Sometimes the worst intentions have unexpected results. Many times the effects aren’t visible for years. A decision might seem right for a while. And then the repercussions come around on the next generation. Only then does it become clear that it was a bad choice. A decision made over a century ago can still impact people’s lives today. In my head, I like to picture all the branches in a decision tree. It’s probably why I often wonder what I would change if I could. So I posed that question to my characters. What if you could go back in time? Would you change things? What if changing things risked your world’s existence? Would you still do it? Those kinds of tough choices show someone’s true nature. And the choices my characters made revealed so much about who they were at their core. She tried to ignore them. But some things won't be ignored. Kat Preston doesn't believe in ghosts. Not because she's never seen one, but because she saw one too many. Refusing to believe is the only way to protect herself from the ghost that tried to steal her life. Kat's disbelief keeps her safe until her junior year at McTernan Academy, when a research project for an eccentric teacher takes her to a tiny, private island off the coast of Connecticut. The site of a grisly mystery, the Isle of Acacia is no place for a girl who ignores ghosts, but the ghosts leave Kat little choice. Accompanied by her research partner, Evan Kingsley, she investigates the disappearance of Cassie Mallory and Sebastian Radcliffe on their wedding night in 1886. Evan's scientific approach to everything leaves Kat on her own to confront a host of unbelievables: ancestral curses, powerful spells, and her strange connection to the ghosts that haunt Castle Creighton. But that is all before Kat's yanked through a magic portal and Evan follows her. When the two of them awaken 129 years in the past with their souls trapped inside the bodies of two wedding guests, everything changes. Together, Kat and Evan race to stop the wedding-night murders and find a way back to their own time and their own bodies before their souls slip away forever. K.C. Tansley lives with her warrior lapdog, Emerson, on a hill somewhere in Connecticut. She tends to believe in the unbelievables—spells, ghosts, time travel—and writes about them. Never one to say no to a road trip, she’s climbed the Great Wall twice, hopped on the Sound of Music tour in Salzburg, and danced the night away in the dunes of Cape Hatteras. She loves the ocean and hates the sun, which makes for interesting beach days. 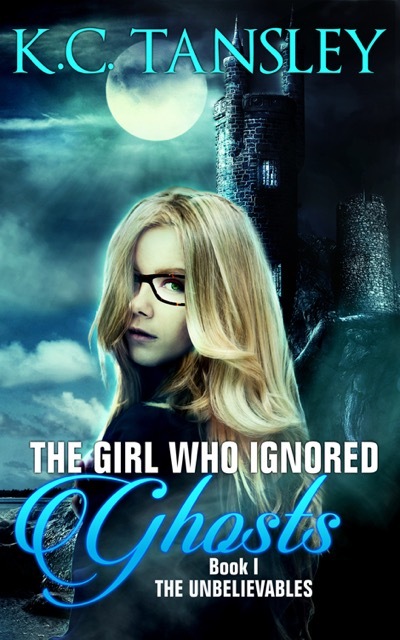 The Girl Who Ignored Ghosts is the first book in her YA time-travel murder mystery series. As Kourtney Heintz, she also writes award winning cross-genre fiction for adults. It's an interesting concept--if we could go back into our own past, would we change anything? Hard to say, because one little change could have such a ripple effect. What if it meant not having the people in my life that I have now? Tricky dilemma for sure. This is really a fascinating take on the decision-making process. If I remember correctly, the Iroquois believe that decisions should be based on how they will affect the next seven generations. (Something I wish more of us would do.) The four "allied families" in Kat's world have a chance to see such long-term effects of some of their decisions. Alas, after the decisions have already been made and put into action! It's quite a dilemma. Risk losing what you have with no idea what you might gain. I think I would take the risk if I could change something really important like a friend's death. I love seeing how interconnected things are and how far reaching consequences can be. Wow that's a really cool take on decision making. Exactly. I kind of hoped it would make people pause for a second and think a little more about their choices before they make them. Yes, it would be hard not to change something like that. But then you think, well now that person will have kids, and they'll have kids, and how will that change the world? Interesting concept for sure. That's the fascinating thing about the concept of time travel - the 'what-ifs.' Everything affects something else, even the little decisions we make every day. Seven generations? I love that. Especially when it comes to decisions involving politics or the environment. I'm sad to say there have been many times in my life when I haven't thought beyond next week when making some pretty big decisions. As I've gotten older, I've tried to be more thoughtful when making decisions. Precisely what I was playing with in the book, Tricia! I love how intertwined things can be. That's really foreword thinking. :) I think we need more of that. Sometimes it's hard to see beyond the immediate future. Or the consequences aren't clear in the distant future.